The idea of trauma has become so used in the public sphere as to become almost meaningless in its ubiquity. But this is also to say that we live in a historical moment in which society feels bound to its traumatic experiences. Trauma, it would seem, has become a cultural trope. Furthermore, contemporary trauma theory suggests a performative bent in traumatic suffering itself – the trauma-symptom is, after all, a rehearsal, re-presentation, re-performance of the trauma-event. This is not to trivialise traumatic suffering or detract from the insistence that trauma narratives must adequately, truthfully, be borne witness to so as not to diminish the weight of the original event. 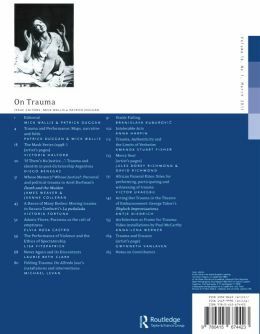 On Trauma explores a range of instances in which performance becomes a productive frame through which to address traumata and/or where trauma theory illuminates performance. 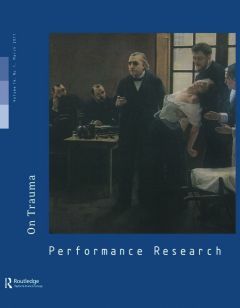 With papers examining topics from African funeral rituals to witnessing, and ethics to Argentinean scratches, this issue of Performance Research benefits from a cross-cultural dynamic which brings together academic articles on and artistic responses to performance that embodies, negotiates, negates or provokes trauma.